For every great sword master there were just as many not so great beginners! You are ready to take the plunge by setting up your own backyard cutting dojo but where to begin? A sword is the ultimate place to start but the information available is so vast and in many cases contradictory depending how far you look. How do you decide what to start with, without breaking the bank but still having fun? Why not start with an economical �noodler�? We offer several entry level swords for you to get your feet wet. You don't need to break the bank to know if you enjoy this sport. Once you have an appreciation for the fine intricacies of high level sensei grade swords you will find that we have a vast selection available ranging from several hundred to several thousands of dollars. For a beginner, there is no shame in starting with an economical sword for a couple hundred dollars or less. That being said, never ever under any circumstance's try to use a decorative sword. They are not real swords. The swords in this price range are far from historically accurate but are great for the backyard cutter using pool noodles or tatami to learn proper cutting technique. 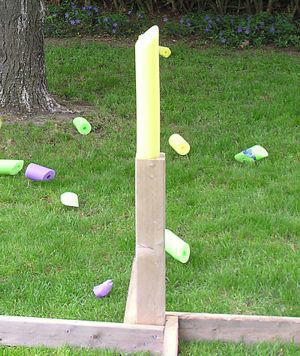 If you are not training in a dojo we normally recommend you start with pool noodles for targets. They are inexpensive and soft enough that they are less likely to damage your blade on a bad cut which is possible with tatami or harder materials. The foam noodle also shows a very clear path of your cut as well so you can visually see whether it was straight or curved through the target or whether or not you twisted on impact. Once you are comfortable with your technique and you can make straight drawing cuts seamlessly you may want to consider upgrading to swords that can handle more traditional cutting like tamashigiri. The noodles are also very inexpensive so you can have a great afternoon without the expense of tatami mats. Each of the pieces in this series will have a tempered high carbon steel blade, a proper tang and will be properly constructed for light cutting. This includes pool noodles and single rolled tatami. We know you saw a video somewhere online of people cutting bottles of water, but that is not what these pieces are made for. Water bottles are very hard targets and you will be asking for damage to occur. Enjoy and always practice safely!